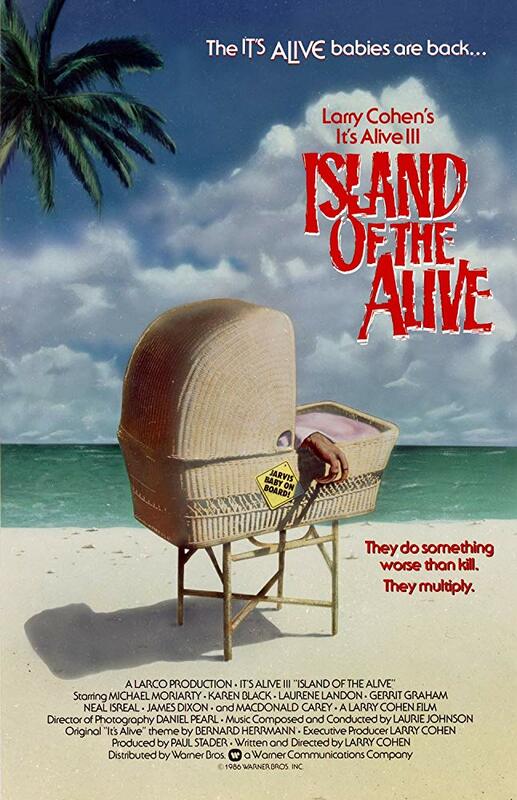 John’s Horror Corner: It’s Alive III: Island of the Alive (1987), the over-the-top monster baby sequel wandering into B-movie waters. MY CALL: If part I was a horror film and part II was more medical Sci-Fi thriller, then part III is a drama that turns into a boring adventure movie and then closes as an escape thriller. I wasn’t a big fan, but this B-movie is watchable for the sake of finishing the franchise. 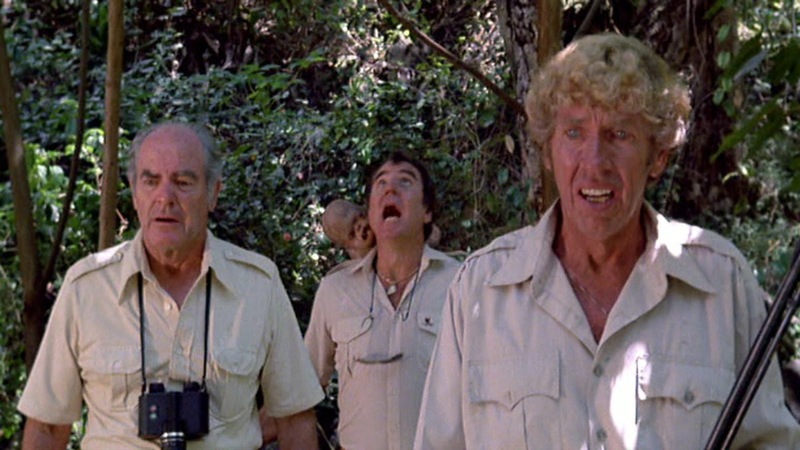 MOVIES LIKE Island of the Alive: We assume you’ve already seen It’s Alive (1974) and It Lives Again (1978)… both of which were better in my opinion. Although I know some who favor part III over part II. It’s Alive (1974) left the door wide open for a sequel, closing with “another one’s been born in Seattle.” Then It Lives Again (1978) broadened the scope of the story into a mutant baby epidemic as Frank Davis (John P. Ryan; Class of 1999, It’s Alive, It Lives Again) traveled the country trying to save these dangerous miscreants from execution at birth. I love that these sequels have been named in the spirit of old classic horror and Godzilla movies that include “Son of” or “Island of” or “Return of” subtitles. We have taken a journey from a strong original horror (1974) rich in allegory, to a somewhat campy sequel (1978) with a moral tale, and now (1987)—opening with a decidedly schlocky and gory taxicab birth scene—finally to something of a pure B-movie. The expecting mother’s belly convulses like a drunk puppet, followed by the screeching cries of the monster fetus and the screams of the unfortunate passerby aiding in the delivery whose hand is mangled before he is dragged into the cab to his doom by the newborn. Typical of the franchise, we don’t see all we’d like to on-screen. But in terms of gore and wounds, we’re seeing more than we did in the first two films—which is a definite plus. The latex wound special effects are the best we’ve seen. 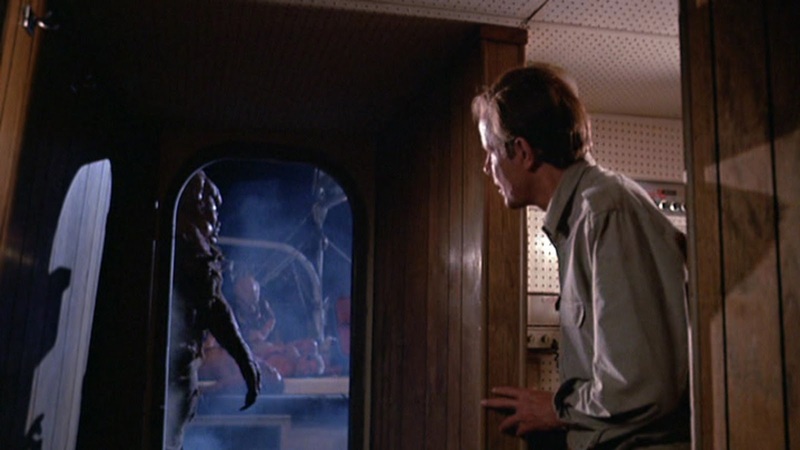 Pleading the court to spare his baby, Stephen Jarvis (Michael Moriarty; The Stuff, Troll, Dark Tower) reluctantly watches as his child and all like it quarantined on an uninhabited island. Far before dinosaurs were reared on Isla Sorna and Isla Nubar, there was the Island of the Alive! However, challenging its originality in terms of monstrous archipelago status, The Island of Dr. Moreau (1977) was released a decade earlier (among numerous others from the 50s and 60s). This sequel skips the allegory and jumps right into some strong religious concepts when a monster baby is found dead in a cathedral apparently crawling its way to salvation via self-Baptism. The monstrous baby is now stop-motion animated (instead of a rigid rubber puppet) making it extra creepy and, frankly, more fun to watch even if a bit cheesy. And speaking of fun, this sequel is embracing some deliberate humor as well—perhaps inspired by the popularly silly Nightmare on Elm Street sequels speckled with Freddy’s humor. 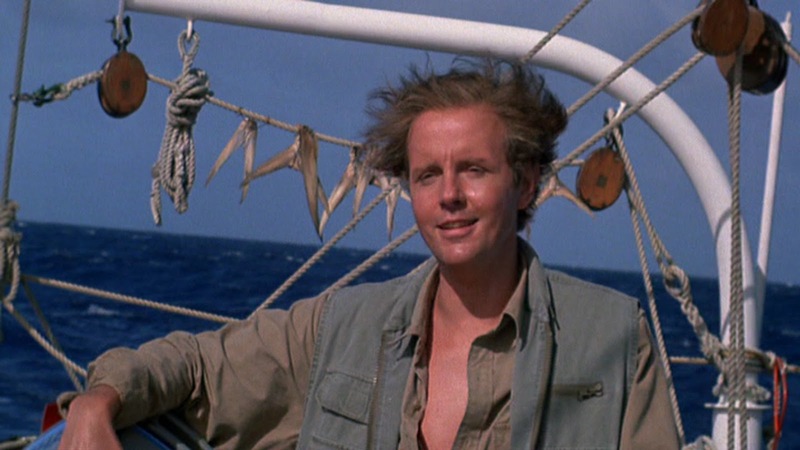 A master of both drama and disenfranchised cynicism on the screen, Michael Moriarty does honor to the franchise, giving a strong performance to follow-up John P. Ryan (as Frank Davis). We additionally meet Ellen Jarvis (Karen Black; House of 1000 Corpses, Mirror Mirror, Night Angel), an intolerant prostitute (Laurene Landon; Maniac Cop 1-2, The Stuff), and the return of Lt. Perkins (James Dixon; It’s Alive, It Lives Again, The Stuff, Maniac Cop 1-2), who comes to recruit Jarvis to join an expedition to the quarantined tropical island several years later to document the development of the isolated mutants. Once on the island, Jarvis hits full-tilt bonkers as he tortures his expedition mates with his over-the-top humor! 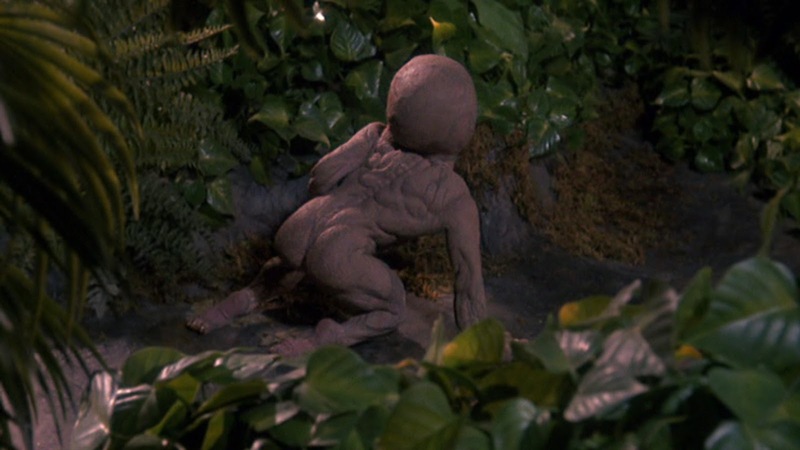 Less amusing to me was how all the island babies have become ogre-like monsters (actors in dumb rubber suits with mostly stationary faces) that lead an escape expedition of their own back to the mainland United States. I was on board for the first hour, but this third act derailed my interest. Yes, this film offered some allegory regarding misunderstood demographics (e.g., Cubans and mutant baby monsters). But this allegory didn’t provide anything we hadn’t already experienced in It Lives Again (1978). So, like so many sequels trying to be bigger and better than before… sometimes more is just more and hardly needed in the first place. I guess this was mildly entertaining, much like its predecessor sequel. But for me, It’s Alive (1974) should have probably been left alone and sequel-less.